Welcome to the SMFM Podcast Series! 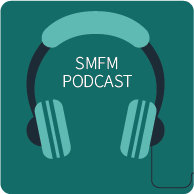 We launched the SMFM Podcast in February 2018 to highlight a range of topics that touch MFM. From congenital heart disease to mental illness, 3D ultrasound, preventing burnout and more, new episodes will released monthly. This series is available through iTunes and Google Play as well. Subscribe to the SMFM Podcast Series on your mobile device today! If you would like to submit a topic for consideration, leave a comment, or are interested in being a guest on our podcast series, please contact Chris Coleman at ccoleman@smfm.org. Join Dr. Vricella as she discusses immediate postpartum long-acting reversible contraceptives (LARC) which can help women prevent unplanned pregnancies and short interpregnancy intervals. Maternal sepsis is a significant cause of maternal morbidity and mortality. Join Drs. Judette Louis and Tony Kendle as they discuss the Society for Maternal-Fetal Medicine’s new publication, “Sepsis During Pregnancy and the Puerperium.” In this podcast, they define sepsis and review the evaluation and management of sepsis in pregnancy and the postpartum period.